Not Your Average Jill Stein Interview, Forbes, October 3, 2012. Jill Stein, the Green Party’s Presumptive Presidential Nominee, Makes Inroads. Wall Street Journal. July 1, 2016. Green Party candidate Jill Stein makes campaign stop in Topeka. Topeka Capital-Journal. July 2, 2016. ‘On Contact With Chris Hedges’: Jill Stein on How, and Where, Revolution Can Actually Happen. Chris Hedges with Jill Stein, On Contact via Truthdig, July 31, 2016. ^ Mass. doctor Jill Stein wins Green Party's presidential nod. USA Today. Associated Press. July 14, 2012 [July 15, 2012]. ^ Levenson, Michael. 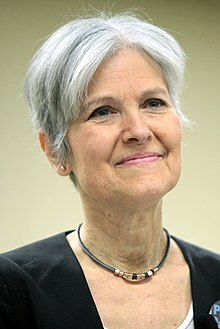 Jill Stein launches bid for Green Party presidential nomination. Boston Globe. October 24, 2011 [24 October 2011].